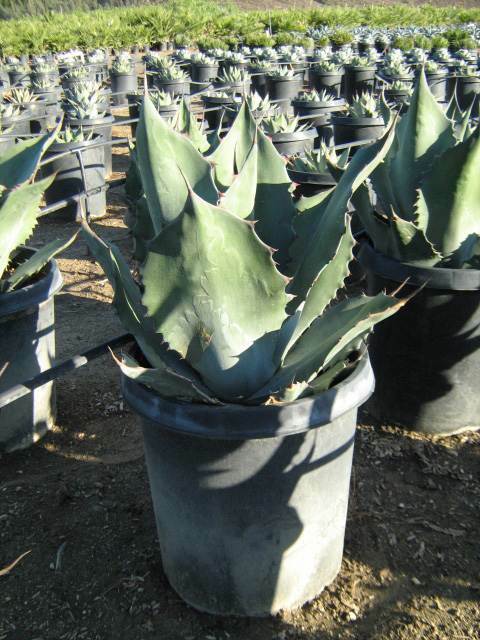 Agave colorata is a splendid medium-sized blue agave. Only slightly less cold tolerant then americana, this agave definitely worth consideration in spaces where a blue agave such as americana is desired but is disqualified by its size at maturity. It’s rosette growth habit comprised of bold, broad, tapered deep blue green leaves stenciled with marvelous zig zag leaf patterns and armed with large contrasting dark brown teeth make it a striking architectural accent. It is able to serve singly as an accent or can be used in quantity as a stunning mass planting. Tough and easy to care for this cold hardy, drought tolerant agave will add color, interest, and beauty with little more than a bit of supplemental watering in the driest and hottest parts of summer.